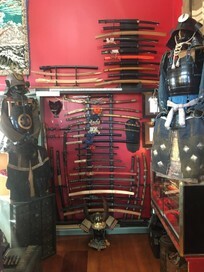 We have the largest selection of authentic Samurai Swords, fittings and armor for sale in NZ. We also sell Antiques, Collectabl­es and Retro items. General sword repairs. Free Sword appraisals including signatures and maintenanc­e info. We can offer a trade and lay buy service on all shop stock. We currently deliver, post or courier items through out NZ and have shipped items to overseas customers without any problems. Monday to Sunday, 9am – 5pm. Phone for private viewing if required. Check this site for our next antique fair Exhibition­. Dating from the 1100s to 1940s we have authentic Yari, Tachi, Katana, Wakizashi, Tanto, Daisho, WW11 Gunto, sword fittings and Samurai Armor. This selection allows us to cater for both the experienced or first time collector or martial arts practitioners. If we do not have what you want in stock, we will endeavor to source it for you through our networks. The shop also displays a large variety of unique Antiques, Collectables and eclectic Retro items.These have been acquired in NZ and from overseas suppliers From Ceramics, Glass and Furniture, to Militaria,Art and Maori craft. There is something for every one. We are always looking for those special items you may want to sell or trade so contact us. The shop is called EMPIRES so call in and see us when your in the far north or on your way to the top of NZ. Hi, Are you open tomorrow? Amazing collection and highly knowledgeable. Thanks for my katana. Many thanks for another great purchase. Buying authentic Japanese artifacts, like swords and their fitting, there is only one man to see, and its Bill. I have done Martial Arts and then Iaido for over 46 years, and you come to know truth from fiction when a man talks. Bill is one person that I will sit down with and listen too. Thanks again Bill. cheers. Im a bit concerned knowing that any original swords must be stolen.As an 'expert' you must be aware of this. Do you try and get them back to their real families? Fantastic trader, we bought 2 vintage samurai armour suits from Bill and hired another antique for a television commercial shoot. He (and his lovely wife) was helpful, professional and friendly. Great trader!! Thank you Bill! Thank you, very helpful and informative, Highly recommend to anyone. Cheers.Paul. Bill Subritzky: thanks Paul enjoy your swords. This is one of a very few original Samurai shops where you get the best in service and authenticity for genuine artifacts. Well done Bill. cheers. Bill Subritzky: really appreciate the positive feedback,trust your recent purchases fit your swords.